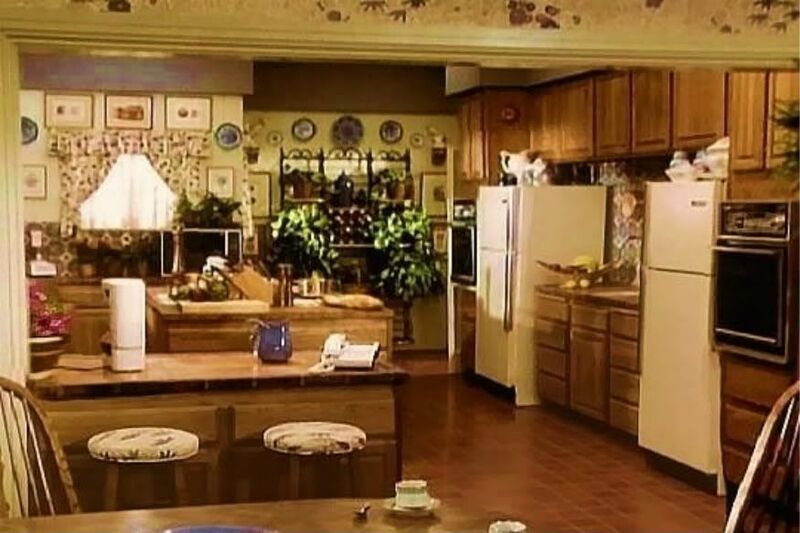 What quirky preferences did you have about the rooms at Southfork, or other homes, on DALLAS? What changes did you appreciate or not, or what changes would you like to have made yourself? For me, while I like dark paneling, and usually consider its removal sacrilege, I rather liked what they did to it during the season involving the fight over Jock's will: the gold wallpaper with tan wood trim, the plants, the emerald rug (before it was quickly discarded), although their removal of the green marble square over the fireplace seemed goofy since it would have gone well with the new decor. I love seeing pictures of the sets on these shows. Although it's been years since I watched Dallas' best years. I cant really remember many of the sets. But that re-do with the wallpaper was an improvement yes. About 20 years ago when we moved into our current house it had that kind of wallpaper everywhere. I can remember having to strip it off. I'm still trying to figure out where the gym was. Would Southfork have a basement? Mentally, I place it in front of the garage, but I've made that up. Once, they implied it was upstairs. In the real house, there's a door with lock on it in the foyer which would logically lead to a basement (would you slap a lock on a coat closet?). In terms of DALLAS fiction, one would assume a ranch house built in the 1930s in Texas wasn't built on a slab. 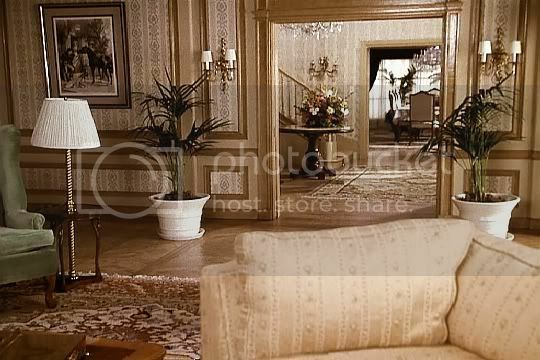 What I liked about the original decor of Southfork was how it reflected the series. Dark, slightly claustrophobic which reflected how the Ewing family lived until the outsider, "that Barnes woman" arrived. 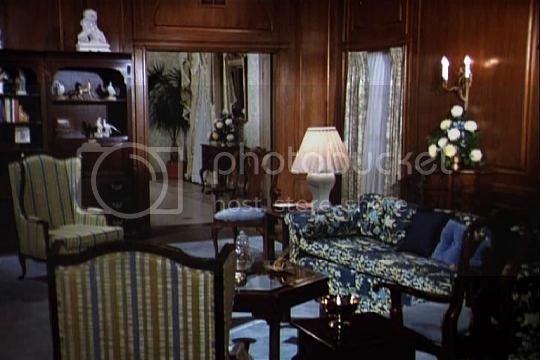 As the series progressed they lightened the interior, most notably post Southfork fire, although I'm inclined to believe this was the Dynasty influence. 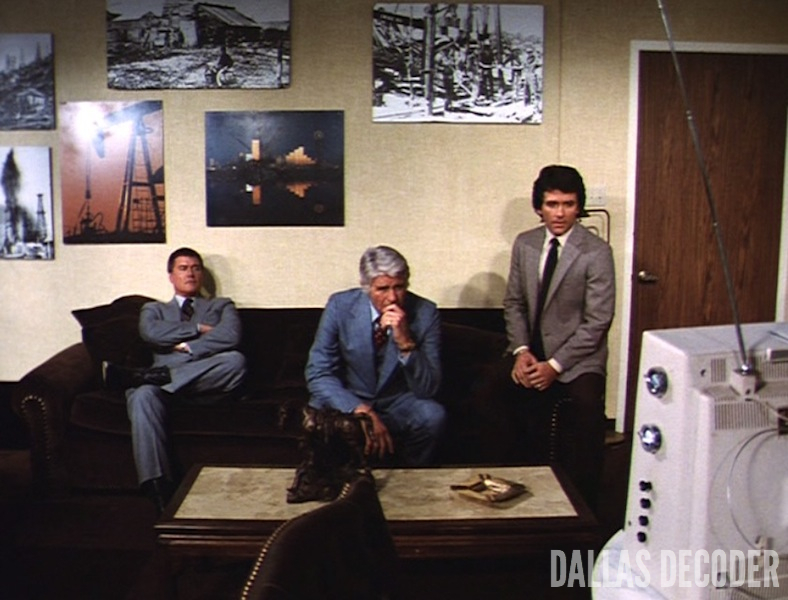 It's a real pity the set decorators for TNT Dallas did not reflect modern tastes by visiting 4800 Park Lane and replicating what they did there. 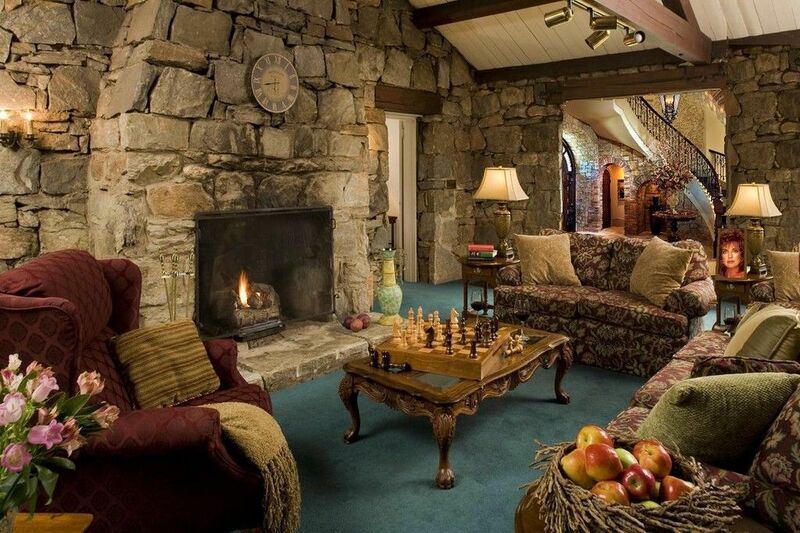 I couldn't make sense of where anything was with the pottery barn layout. I always want to put a dormer window on the wall to the left of Bobby and Pam's door; logically, they're over the dining room. Ewing Oil offices got better & better - especially love J.R's new office door in later seasons - big & bold. In the two pictures with the gold wallpaper weirdly the light fittings either side of the doorway change. In one picture they only have two bulbs on the other they have three bulbs. The one with the two-bulbed lights is from 1983; the one with the three-bulbed lights is from 1985 or beyond -- notice the darker trim on the latter. I much prefer the mid 80's decor to the late 70's one of the living room. It is much brighter and more elegant. Also the chairs are in one color instead of those horrible 70's patterns (stripes and flowers). Well I got nothing from this. Except the timber floors, I like timber floors. Are you actually talking about the floors or about Emma...because Emma was far more wooden than the floors! 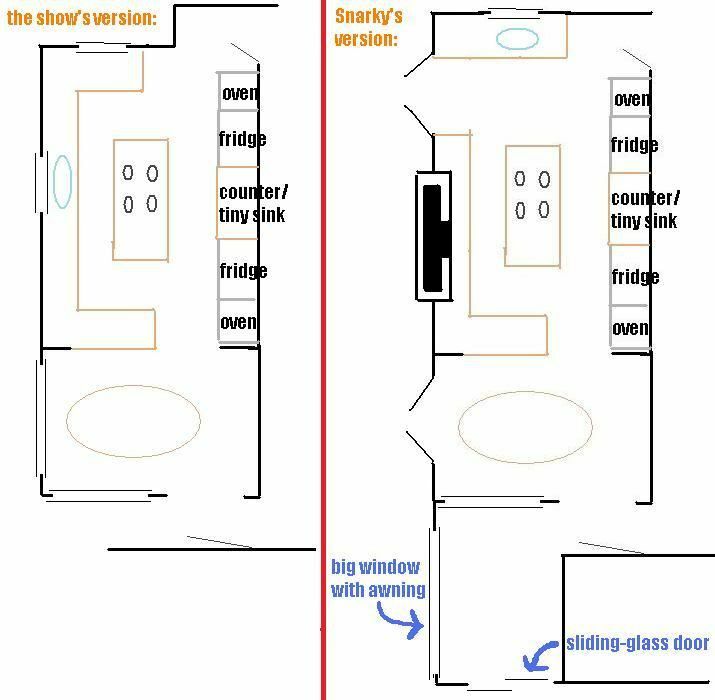 I always want that feminine half-circle window over Lucy's bed to be a dormer; I picture her room at the opposite end of the cross-hall from Bobby's and Pam's, as if Lucy's room was over the living room. Although "Runaway" seems to suggest her room is directly behind Bobby's and Pam's room, presumably based on the arrangement of the Caulder house. And speaking of "Runaway", I wish they'd kept that circular upstairs balustrade when they built the upstairs hall set in 1983. It looks good and it just makes more sense. And wouldn't something like this be lovely for, say, the reboot? I liked how the sets changed, evolved over time. 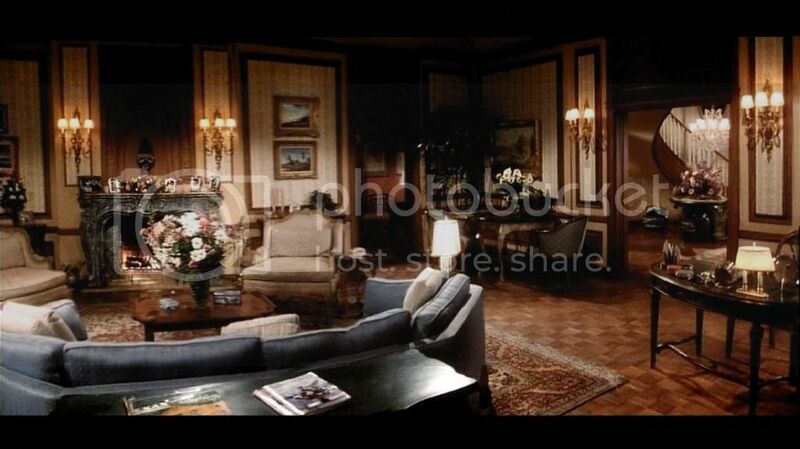 Southfork and the Ewing Offices were like characters themselves. They added so much to what happened in Dallas. What about the later offices? They certainly were an improvement over the dentist office decor of Jock's era. I really liked the look of the offices in the later years with the rich wood and lighting.